A baby goat that appears to have human features was discovered on a farm in Malaysia. Photos of the animal were being spread on Facebook, reported the Asian Correspondent. The baby was born in the state of Johor. The baby did not survive the birth and its body was handed over to the Veterinary Services Department for observation. The Star reported that the animal was born on a farm belonging to palm grower Ibrahim Basir, who got lucrative offers for the body. Basir said he believes the baby was trampled by its mother, adding: “We kept the carcass in a polystyrene box filled with ice cubes before taking it to the district veterinary office at around noon yesterday,” according to the Mirror. Jamaludin Abdul Samad, 50, was the first to see the goat. “When I went to check, I was quite shocked but fascinated too as its face, nose, short legs and even the condition of its soft body seemed like a human baby, but the light brown fur covering its whole body resembles that of a goat,” he said on Sunday. The baby was also born without an umbilical cord. 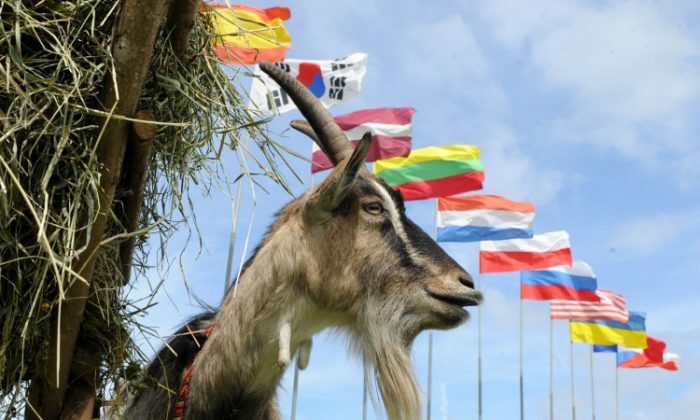 “This is what sets the baby goat apart as usually they would be born with the umbilical cord attached,” he said, reported the Malaysian Digest. After photos of the baby goat spread, some joked that it strongly resembled “Star Wars” character Chewbacca.